The September 9/12 CPQ Meeting has been cancelled. CPQ Meeting Canceled for Tuesday September 12, 2017. In an abundance of caution I am canceling our meeting this coming Tuesday. UGA has already announced (Sunday afternoon) that all classes and activities are canceled through Tuesday. Clarke County Schools are closed Monday but there is still no decision on Tuesday. National Weather Service has issued the first ever Tropical Storm WARNING for Athens / Clarke. Strong winds are predicted which may likely result in power outages. So stay home and be safe. We are moving into high gear as we prepare for our 2017 Quilt Show! 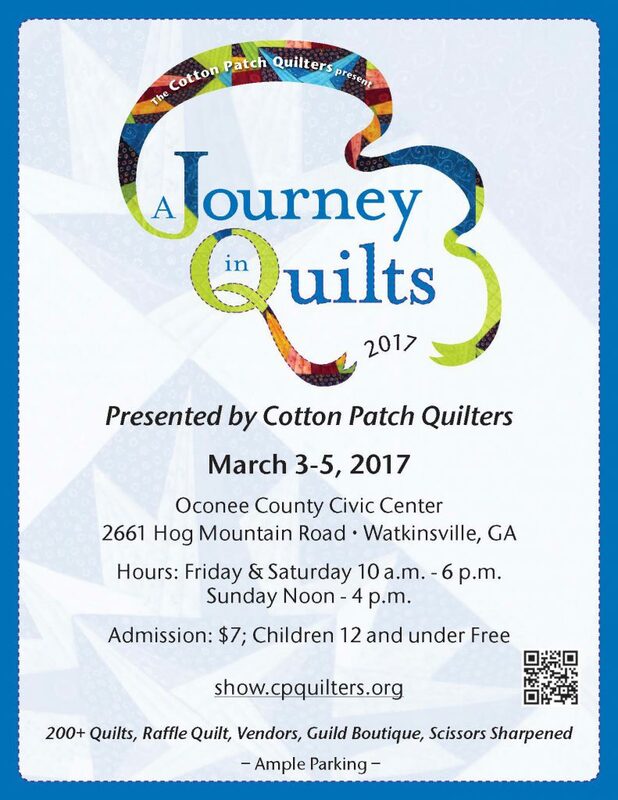 150+ fantastic quilts to view, guild member crafted items to purchase, a raffle quilt and vendors booths to browse! Sneak Peak at Upcoming 2015 Workshops! We have several workshops coming later this year! Here is a sneak peak- be sure to check back later for more specific information! New 2015 Quilt Show Website! I am happy to announce that a new website has been designed for the Journey in Quilts 2015 quilt show. It has more details on our participating vendors, raffle quilt, directions and the boutique. You can visit the new quilt show website at http://show.cpquilters.org! The February meeting will be “Game Play”. Each member will need to bring 4 spools of thread and 4 fat quarters to participate in a game that will leave you laughing. There will be several winners so don’t miss out on this! Also at the February meeting will be a short talk by Joan Prittie, the director of Project Safe that is one of our primary charities that we contribute to. She will update us and let us know firsthand how our guild has impacted them. Thank you to Chris Langone for the update!